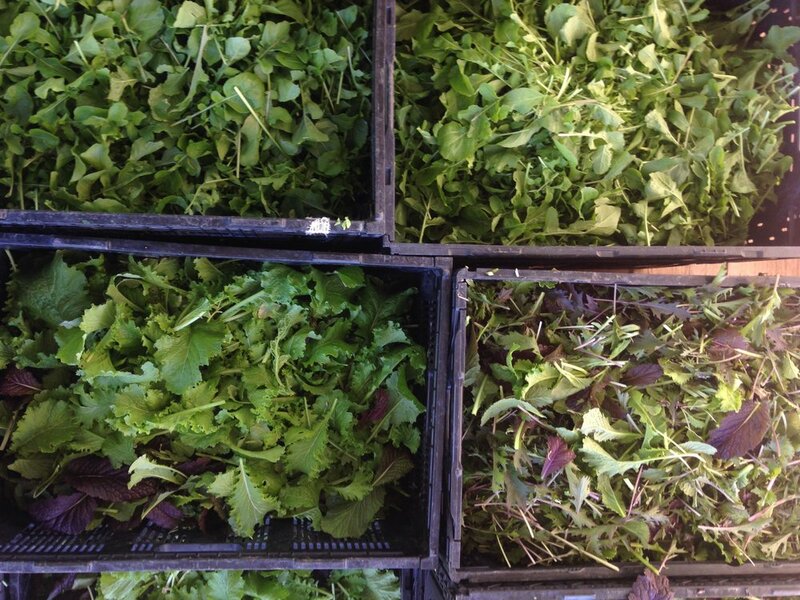 Freshly harvested spicy mix and arugula. Eat your greens! Turns out we are having a real fall here in Northern Colorado, which to be totally honest, I didn't plan for. As an intensive community vegetable farmer, we try to watch the trends, plan for the "normal" and then deal with whatever we end up getting. When we first started farming, it seemed that we often got snow in October and had lots of frosty days from mid-September on. Over the last few years, the trend seemed to change to warm, sunny falls that often just ended suddenly, and seemingly overnight with winter....which is what I had mostly planned for this year. But here we are, with a cool and wet fall that has seemed to come early and might just arrest my best laid plans. With snow in the 10 day for Monday and Tuesday, it is anyone's guess as to what we will have available and when we will have it. Some years are just better than others, but at least we are all on the edge of our seat together. Greens are back in full swing on the farm these days as we got a pretty good frost on Monday night. Greens and roots get better the cooler the temperatures are, so at least we got that going for us this fall. You have probably noticed that spinach is back and will be a staple at the farm over the next 6 months. I love to have it on hand to put in just about anything as it is a versatile veggie that can be eaten raw or cooked. Baby Bok Choy is also back. It is great in spicy Asian noodle bowls, put in a stir fry, or served by itself as a side with some sweet garlic chili sauce. This will be the last week for Tomatoes, Peppers, and Eggplant, so if you haven't gotten your fill yet, be sure to grab some from the stand. If you haven't done your kohlrabi duty yet, you have 2 more weeks, so be sure to make room in your fridge to take up the cause. We have a few extra cases of roasted chilies that are up for grabs. For those of you who care, they are an Anaheim variety and are a mix of red and green. I would say they are of medium spice. They come six bags to a case and cost $30. They are pre-order only and I will have them for folks starting on Saturday. If you are interested, please email me and I will try to get you on the list. We can do a pick-up next Wednesday also, so let me know which day you would prefer. If you do not come to get your chilies on the agreed upon day, you forfeit them to the next person one the list. No exceptions.